We’d love your help. 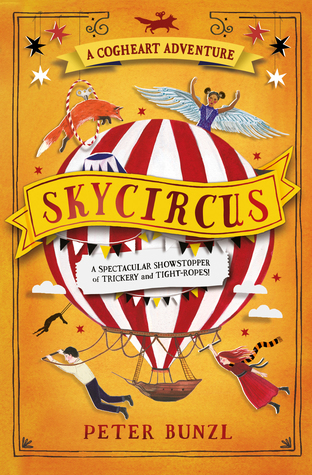 Let us know what’s wrong with this preview of Skycircus by Peter Bunzl. To ask other readers questions about Skycircus, please sign up. 3.5/4 stars. A wonderful new adventure in the Cogheart series! Not another mystery to solve in this book, just a very dangerous circus to escape from. After searching for Lily’s father and chasing a criminal through London, Lily and Robert get involved in a mysterious Skycircus. We see familiar people return – Tolly, my boy <3 – and old issues like Hybrids being discussed: how should Lily present herself to the world? The wicked Skycircus has a plan for that! That Skycircus was the highlight o 3.5/4 stars. A wonderful new adventure in the Cogheart series! Not another mystery to solve in this book, just a very dangerous circus to escape from. That Skycircus was the highlight of the novel for me. Bunzl really did his best to bring the circus world alive: from describing the layout of the tent, inside and outside, the slang spoken by the crew, to the set-up of the acts themselves. The author also uses the circus to really turn up the danger. Walking on tightropes without a safety net, being locked up in a cage full of lions, being subjected to X-ray radiation: talk about heartstopping moments! But where the setting and the adventure itself were fantastical, the too-mature dialogue really got on my nerves. Especially near the end Lily was way too forgiving about people’s actions (also: the whole radiation-scare was just…brushed aside?!). Seeing 14-year-olds give monologues about acceptance and “standing together” really breaks the middle-grade mood. Yet the message of this third book is one both kids and adults will appreciate: if you fall, just pick yourself up, and try again. Another fun whimsical adventure, but really Mr. Bunzl, skip the long monologues next time. Have loved every moment of this trilogy. Brilliant. This is the weakest book in this series so far, and it was a really weak book. At this point, I'm not sure I'll bother to read the rest of the series, if there are ever any more books in it. The writing is still ok, but there's so much repetition and fluff, it felt like it could have been cut at least pages in repetition and such. Ok, that's an exaggeration, but it's what it feels like having read it. I don't feel that the writing style had evolved all that much since book 1, and that is disappointing, for I felt the language was a little heavy back then, and that hasn't changed. The story in this book is slow and rather uninteresting. Sure, there are some fun hints to what created steampunk to begin with, but not enough. And there is a rather important message in this book, one I would like as many kids to read and learn as soon as possible, but that doesn't make up for the slow and boring story. While Lily thinks about how they've all grown and changed, I can't say that I agree. They're pretty much the same as they were in book one. A somewhat scared but still brave boy, and a spoiled girl. I don't much like them, and the only character I feel any interest n, is Malkin! As said, this is a children's book, but I don't think that's an excuse to make as grave errors in regard to animal nature as the author did here. It is rather clear that Bunzl focused on doing things that would be exciting for the story, rather than thinking about the belivability - and yes, I know it's a book about a girl with a clockwork heart, but that doesn't make it ok to change something as natural as animal instinct in the way he did here. OK, it is a small thing to be annoyed over, but it really rubbed me the wrong way then it was introduced, and it continued to rub me the wrong way as things progressed. Sometimes, real life is much more scary than what you can come up with, and if that tiger had been allowed to finish the job, it would have been a much greater lesson to the kids. Not my favourite in the series but a quick and enjoyable read anyway! If you liked the previous two books, you'll like this one. It is wonderful and whimsical, with some great messages - be yourself, be honest. It is okay to be different. Failure is fine as long as you always just try again. "I know that, Papa, but you have to let me make my own mistakes. You can't worry about me flying too close to the sun. Failure is how you learn and how people grow. People need to fly on their own - on the wings they make for themselves - not the ones their parents give them." L If you liked the previous two books, you'll like this one. It is wonderful and whimsical, with some great messages - be yourself, be honest. It is okay to be different. Failure is fine as long as you always just try again. Lily and Robert get swept away to Paris by the mysterious Skycircus. This was an amazing setting. Peter Bunzl put a lot of detail into it - how it looks, functions, the people in it, what they wear, how they speak, what they eat, what their talents are. It all came to life for me. "When you're different to other people they don't believe you're as good as them, and you have to prove it. The trouble is, you have to prove it over and over again. You have to fight every day to be treated the same, and sometimes it gets so wearisome." "It's like your story, the one about Icarus. If you fail, if you fall short, you pick yourself up and make stronger wings for the next flight. " There were some plotholes that annoyed me (like items lost/destroyed at the start of the book but magically reappearing later) and there is some dangerous event near the end of the story of which the consequences are just ignored. All of our favourite characters make their appearance, and we get to meet quite a few new ones as well. All of them are flawed, and most are likable in one way or another. Overall, this was a fun and whimsical adventure, which sadly concludes this wonderful series. What a wonderful final instalment of this fabulous trilogy! I've simply loved reading it to my 11 year old daughter. Just wonderful. While I did enjoy reading Skycircus on the whole, I did also feel as though it was the weakest instalment of the series to date. The story this time focuses on the concept of the hybrids, which had been touched upon in previous novels but never truly explored. It explored the public conception of these "half mechanicals", as well as the benefits of the technology. In doing so, the novel carried a nice message concerning accepting people different to you and not fearing things that are different. While I did enjoy reading Skycircus on the whole, I did also feel as though it was the weakest instalment of the series to date. The story this time focuses on the concept of the hybrids, which had been touched upon in previous novels but never truly explored. It explored the public conception of these "half mechanicals", as well as the benefits of the technology. In doing so, the novel carried a nice message concerning accepting people different to you and not fearing things that are different. This was all delivered in a very neat way that did not feel too heavy-handed or difficult for a young reader to understand. Yet the novel still felt as though it was lacking something. While the centrepiece of the circus set this novel apart from its previous instalments, it caused the series to loose a little of its charm. There is less focus on the steampunky Victoriana this time around, as the story is almost entirely set within the sinister circus. For me, this was a bit of a shame. The setting of the previous stories is what made them stand out. Skycircus unfortunately seemed a bit more generic. It's hard to put a finger on why this book did not really do it for me but I think my problem is two-fold. First was the pacing. While previous instalments both offered some kind of mystery, this was oddly lacking in Skycircus. Due to this, the novel felt as though it moved in fits and starts. Between the intriguing start and exciting finale, the plot slowed to a crawl and I found that it did not really keep my attention. My second issue was the weakness in the story's science. While I accept this is a personal issue, I found that it was harder for me to "buy into" the world building of this novel. While I could accept the existence of an artificial heart, a girl that could fly with metal-feathered wings due to her "light bones" stretched my plausibility a bit far. In a novel that name drops such great minds as Nikola Tesla, Ada Lovelace and Mary Shelley, I wished that more time had been spent introducing their contributions to science, literature and women's rights to the young readers. It felt a bit like Bunzl took the most outlandish parts of their beliefs and left out the truly interesting stuff. I also felt as though the novel wrapped up all loose ends a bit too neatly. The climax of this story felt a bit rushed, especially as Lily came to terms with everything that happened with remarkable speed. I do not know if this book is intended to be the final instalment of the series but it certainly felt like it. All threads were tied off without conflict, leaving very few obvious hooks for a future novel. In terms of character, I also felt that the book had a few problems. The novel introduced a large number of new characters but did not take the time to develop them. Lily befriended the other hybrids very quickly and dispelled the distrust between them and the ordinary folks with even more ease. The villains of the piece failed to make much of an impression. The mastermind did not really appear enough to make an impression, while the more direct baddies were purely motivated by greed. The protagonists also did not fair very well. Robert did not get a lot of development in this story, as his arc seems to have culminated in Moonlocket. However, I will admit that Lily does do a little better. While she was sidelined a bit in Moonlocket, this time she does get more time to confront her feelings towards her cogheart. The novel does explore this in detail, addressing her weariness and encouraging her to fight for what she believed in. I especially liked the way that the novel used a somewhat adapted version of the tale of Icarus to explore this, turning it into a story about picking yourself up whenever you fall and always trying again. I was really excited to go back into the world introduced in Cogheart and developed in Moonlocket. Lots more of my favourite snarky mech-fox Malkin, as well as introducing some new characters in the Skycircus, including acrobats and other hybrids. Lily has grown up a little in this book, although she is still recognizably the impetuous, Penny Dreadful-loving girl we met in the first book. In Moonlocket, as the focus was on Robert, I feel like she took a bit of a back seat so it was nice to see he I was really excited to go back into the world introduced in Cogheart and developed in Moonlocket. Lots more of my favourite snarky mech-fox Malkin, as well as introducing some new characters in the Skycircus, including acrobats and other hybrids. Lily has grown up a little in this book, although she is still recognizably the impetuous, Penny Dreadful-loving girl we met in the first book. In Moonlocket, as the focus was on Robert, I feel like she took a bit of a back seat so it was nice to see her getting a bit more time, even though I wished there was more time spent on her relationship with her father. I enjoyed meeting the other hybrids, but learning about them raised SO many questions that I found myself a little unsatisfied with the neat ending, particularly as it had the feeling of a 'last book'. I liked this entire series, but I really hope there's more! Another cracking adventure, this time seeing Lily and Robert work together to save not just themselves, but other hybrids who have been cast out by society. There are some moving moments as Lily becomes friends with one of the circus acts, sharing the story of Icarus and adapting it to suit their purpose. Really enjoyed the final adventure of Lily and Robert. Following the reappearance of an old enemy, the children are whisked away from the safety of Brackenbridge Manor. Lily finds herself among other children who have become hybrids and they work together to change the attitudes of the people around them in order to attempt an escape. As thrilling as the first two adventures. On a number of occasions the reader thinks it's the end for Lily and Robert, that they couldn't possibly escape the peril they are facing but Peter finds a way to help them. Impatiently awaiting for book 4. A utterly triumphant return to the Cogheart world, SKYCIRCUS is a rip roaring adventure like no other, and happens to feature my new favourite named character—Professor Manceplain. I put off reading this book for months because Usborne sent it to me wrapped up super prettily, but I needed a pick-me-up & decided it was time to unwrap it. Skycircus isn’t my favourite book in this series, but it was still wonderful & I adore this world, & it’s characters, that Peter Bunzl has created; I enjoyed every page of this book & really hope there’s a fourth book soon. Extended Review: https://wp.me/p8M I put off reading this book for months because Usborne sent it to me wrapped up super prettily, but I needed a pick-me-up & decided it was time to unwrap it. Skycircus isn’t my favourite book in this series, but it was still wonderful & I adore this world, & it’s characters, that Peter Bunzl has created; I enjoyed every page of this book & really hope there’s a fourth book soon.